[New for 2011] Trying to raise a family without blowing the food budget can be a pretty daunting task sometimes. Sure I treat myself to a blizzard or ice cream pint for lunch on occasion, but it's often cheaper than the alternatives when I don't have any leftovers to bring to work. The same money saving logic applies to our home ice cream stash. Sure I'd love to shower my family with pint upon pint of the premium stuff, but that's not really practical for a lot of us (especially considering how much ice cream we eat). So let's take a look at something that's easy on the budget, and hopefully easy on the taste buds. Let's jump right to the scooped shot. We've got tons of cups, a respectable amount of swirl, and frankly, I'm not that afraid. I dig in, and for a frozen dairy dessert, the texture is decent. I'm not picking up any heavy gumminess, or anything else too crazy. We've got a lot to distract us between the swirl and the cups, plus the cups leave a nice chocolate coating on your teeth as yet another distraction (by that I mean there's a nice lingering chocolate flavor to go along with the lingering caramel flavor). Now I've been thinking about these great looking cups for awhile because I kept trying them but I just couldn't put my finger on their unique taste, but then it dawned on me. This will probably sound dumb, but they taste like coffee. I'm not sure I've had caramel that tasted like this before, at the very least not often, but I don't know how else to describe the gooey little cups other than to say they remind me of coffee. Not a real bitter or dry coffee, but the vibe is there. Don't worry though, you probably won't notice too much unless you start eating the cups by themselves like I did. Thankfully the caramel swirl is more traditional than the cups and in fact the swirl is very sweet. It's oozing everywhere as my bowl melts and so it does a good job of taking center stage flavorwise. This one is an easy scooping bowl, fairly low on the calories and heavy on the caramel aftertaste. 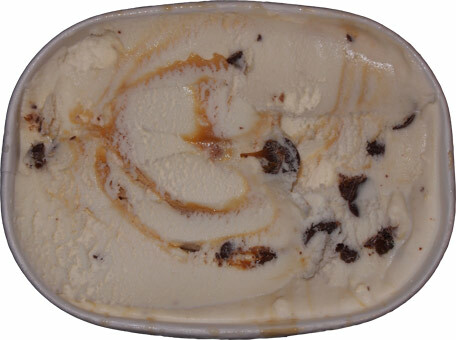 The name implies lots of caramel and it delivers and there ain't nothing wrong with that. On Second Scoop: technically the first scoop was a tasty breakfast sundae (which makes it hard to review), so all the thoughts above are from my second scoop. Unfortunately a third scooping never happened because 48oz of ice cream between 3 people doesn't exactly last a long time, but I did get the thumbs up from the wife, so there's your second scoop. 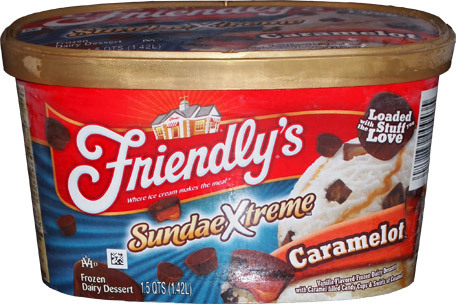 I am a very big fan of Friendy's and they always make solid products at great prices. No shame in enjoying that! You're not crazy, I got the Giant store brand of this flavor a while ago and thought the caramel cups tasted like coffee...well, that's assuming I'm not crazy too!